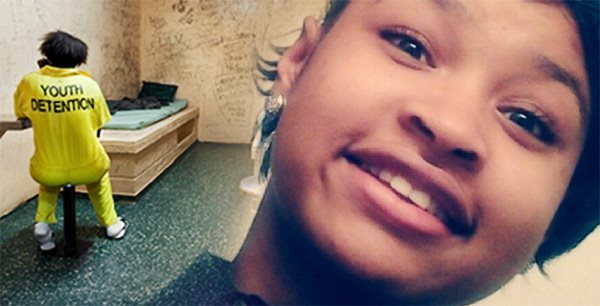 AFRICANGLOBE – A Kentucky family has now filed a lawsuit after a 16-year-old girl took her last breaths inside a cell at a juvenile detention facility — while a guard stood outside, watching. For a full 18 seconds shown on surveillance video cited in the lawsuit, Windham appallingly stood outside McMillen’s cell, witnessing “her last gasps and dying breaths and final uncontrollable movements and seizure” — before turning and callously walking away. Officials claimed McMillen died in her sleep — just 17 hours after arriving at the facility — but that claim isn’t the only troubling detail of the teen’s untimely demise. Seeing my sister in that casket, she didn’t look at peace. She didn’t look like she died in her sleep,” LaChe Simms told CBS News in an interview. “It gave me a real uneasy feeling about what [officials] were saying. If you had a seizure and you’re coughing, that’s not dying in your sleep. It’s not dying in your sleep when you wake up and choke for air. McMillen landed at the Lincoln Village Juvenile Detention Center under somewhat questionable circumstances at 6:07 a.m. After an altercation with her mother — who called emergency services — the teen was arrested by police as she walked down the street. Neither she nor her mother elaborated on their altercation for law enforcement — but Shelbyville police took McMillen into custody anyway. A judge ordered the teen be transported to Lincoln Village, an hour away from where she lived, until a court appearance the following day. Officials say when McMillen arrived she refused to remove her sweatshirt in order to be searched by detention staffers. Minutes later, staffers used an Aikido Control Technique restraint to remove the shirt. Attorneys for McMillen’s estate argue the staffers used excessive force and were not justified when they used the restraint, but state officials say they were following protocol. The youth was lowered to the floor face down, one arm remained raised with the elbow straight as part of the restraint. Her hand and wrist are visible for a few moments, but then move below the counter. After a few moments, the hand and wrist are briefly visible again before they move back below the counter. In another email, Wynn wrote McMillen “continued to resist and kick,” causing two more officers to join in the first two handling the situation. “A third employee held her feet to prevent the youth from kicking,” wrote Wynn. “A fourth female staff member performed a pat-down style search. Once the search was complete, the youth was raised and escorted to the intake holding room” with her hands still held above her head. “From approximately 6:22 am until 3:44 pm, Gynnya was left in the isolation cell 423 on a metal bed frame without a mattress pad or blanket while she balled herself up in her sweatshirt to stay warm,” attorneys stated in the lawsuit. “The mattress is provided to youths at times, but not during the day, because the idea is to keep the youth awake,” Wynn explained, confirming McMillen had not been provided insulation from the cold, metal frame. McMillen left her cell for processing, food and water, and a shower at 3:44 p.m., according to the lawsuit, and returned — mattress now in place — at 5:19 p.m.
Just over six hours later, the teen would perish in her cell as Windham looked on. Clark Baird, Windham’s attorney, argues the guard — and officials afterward — couldn’t have surmised McMillen was on the verge of death. The Kentucky State Police and the Office of Juvenile Justice have all viewed the footage,” said Baird, who also doubts the official time of death, as quoted by CBS News. “The video does not show the young lady moving or thrashing about. I don’t know how they can get a doctor to look at video and say down to a three- or four-minute time frame her time of death. We respect the family’s right to bring this action and remain deeply saddened by their loss. e have also fully complied with three independent investigations, all of which confirmed that this tragedy was the result of natural causes. After reviewing all the evidence, medical examiners were clear that this child passed away in her sleep, without any signs of distress that would have prompted medical attention. Although McMillen was later discovered to have Inherited Long QT syndrome, which causes cardiac arrhythmia, by the Mayo Clinic, it’s possible she would have lived if Windham had intervened instead of standing outside her cell — something the guard, himself, agrees with. Looking back, he sees so many things that could have been done that could have prevented this from happening,” CBS News quoted an investigator’s statement in a Department of Juvenile Justice report. “He agrees if he had done his bed checks and went into the cell to do the wellness check, he may have detected her condition early enough to have gotten her some medical attention. According to the lawsuit, logs of those bedchecks were falsified dozens of times — throughout the 10 hours following McMillen’s coughing fit, officers had a mandatory obligation to check on her 64 times. But the egregious handling of the incident didn’t stop there: the lawsuit contends a worker banged on the steel door to McMillen’s cell at 6:29 a.m. to provide breakfast. When she didn’t respond, he closed the door — and later ate her food. Over the next three hours, staff tried twice more to rouse the teen without success — then, at 9:36 a.m., Victor Holt tried to physically shake her awake before leaving her cell. Beyond all logic, it wasn’t until 9:55 a.m. when staff arrived to transport McMillen for the scheduled court appearance that Lincoln Village finally concluded the teen — whose body was then cold to the touch — had died. Windham and Holt have each been indicted on charges of second-degree official misconduct for falsifying the room check logs, and are among three who were fired over the incident. Officials have repeatedly refused to release video documenting McMillen’s time at Lincoln Village due to the criminal charges against the two youth workers.